Her Royal Highness, the Princess Royal (Princess Anne), visited Cunard's Queen Elizabeth while it was in Southampton on Wednesday (May 23, 2012). She was there in her capacity as Patron of SEA Vision UK, launching the Skills, Education and Awareness (SEA) program, a Secondary School initiative connecting youth with maritime sector career opportunities. As you can see in the video, any time a member of Britain's royal Family visits a Cunard vessel, it's an important day, but this week's Royal visit was enjoyed as much the ship's crew as it was the students who were presented to Her Highness. On Monday (May 21, 2012) morning, watchstanders at the US Coast Guard district headquarters received a call from Royal Caribbean's Enchantment of the Seas asking for assistance for a 67-year-old man who was exhibiting symptoms of a stroke. They dispatched an MH-60T Jayhawk helicopter and an HU-25 Falcon jet to assist. They met Enchantment when it was 210 miles southwest of Cape Cod and hoisted the man from the deck as shown in the video below. He was taken to Massachusetts General Hospital. "Given the poor weather and the distance from shore, we had to meticulously plan the flight in order to conduct the medevac," said Lt. J.G. Garin Kirkpatrick, the Auxiliary Liaison Officer for Air Station Cape Cod. "We're glad we were able to get out there, pick up the patient, and get him to medical treatment." Enchantment of the Seas was sailing from Bermuda to Boston at the time of the medevac. The new Royal Princess is only about a year away from reality, and in earlier video's, Princess has begun to reveal some of the ship's breathtaking design elements. In this video, two of the people most responsible for creating those designs - Princess' VP of Interior Design, Teresa Anderson, and Coordinating Architect of Royal Princess, Giacomo Mortola - talk about the concepts they created. The latest addition to MSC's growing fleet was delivered to them on Saturday (May 19, 2012). 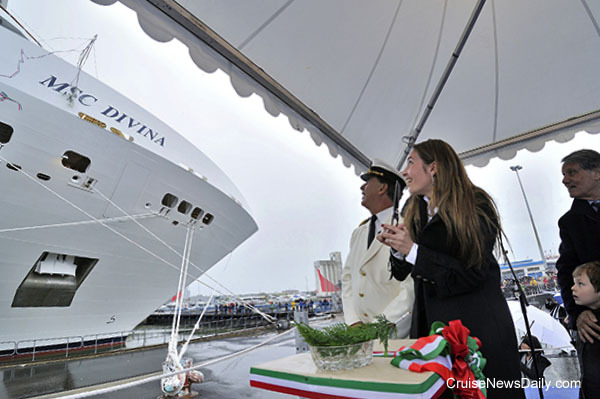 MSC Divina was handed over to the line at the STX France yard in Saint-Nazaire. The new vessel is the third of the Fantasia class measuring 1,094 feet in length, 124 feet wide with a gross tonnage of 139,400 tons. There are 1,751 staterooms and suites which can carry a total of 4,345 passengers. The elegant interior design is once again the work of award-winning naval architects De Jorio Design International. 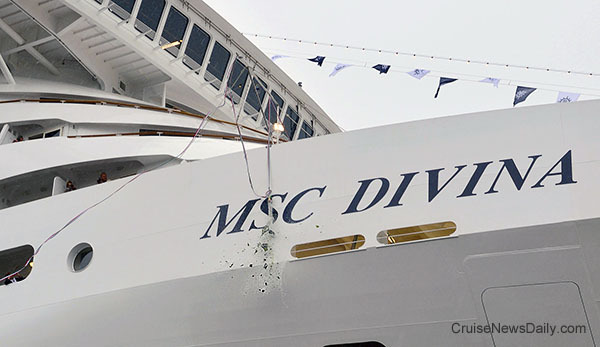 Here, on Saturday, Ela Aponte, the wife of MSC Vice-President Diego Aponte, cuts the ribbon which releases the bottle of champagne to smash against the ship's bow. She is joined on the podium by Gianluigi Aponte, President of MSC group and MSC Divina Captain Giuliano Bossi. The ship will be officially named by Sophia Loren in Marseille on May 29. Meyer Werft has put the final block in place on Celebrity Reflection, as shown in this video. The final block was the ship's bow. Celebrity Reflection is the final ship in the Solstice class although it is a bit wider and taller than the others in the class. The next big event will be the float out, which is scheduled for mid-August. Celebrity Reflection is scheduled to enter service on October 12, 2012.